I was�invited by our editor�to comment on a piece, Talking Back to Prozac, in the paleo-Commie and reliably�long-winded NY Review of Books. The essay/book review by Frederick Crews is semi-hysterically worried about antidepressants, but the real theme motivating the essay�seems to be the astonishing and scandalous�fact that Big Pharma makes money from developing and selling medicine. Well, slap me with a mackeral and call me Mildred. That's terrible news. Maybe non-profits, or the government, or the UN should be developing the new treatments, and giving them away for free. OK, one of the books, the one by Christopher Lane - How Normal Behavior Became a Sickness, sounds like it makes some good points.�Everything is pathologized today (and granted a fancy�diagnosis to get insurance coverage) - and�every child is supposed to be perfect. The assumption is that we/they could be, if only the government or somebody really smart ran the world, like the people at the New York Review of Books. I don't have time to comment further, except to say that antidepressants - the older ones, and the SSRIs and the hybrids, have, overall, been a great boon to mankind. The point is correct that depression and anxiety disorders�are not really�a "chemical imbalance" - except in the case of true Bipolar Disorder (and not the faux�bipolar disorder that everybody and their kid and cousin is diagnosed with these days). That would be equivalent to claiming that a headache is a Tylenol deficiency. Anxiety and depression are usually�symptoms of complicated mental states - time-consuming, expensive, and often frustrating if not impossible�to get a grip on. Some people chose to try to get to the bottom of it, some choose the band-aid alone, and some people refuse medicine. It's a free country. I have always valued Joyce McDougall's A Plea for a Measure of Abnormality:�I am not a psycho-utopian, or any other kind of utopian, but I think we all should be grateful for what the drug companies do. Eliminating pain is God's work.�And no, shyness is not a disease. Thanks for a full dose of good humor. Free drugs in a free country, well describes the local county mental health center. Makes for a fun, almost free, bus route. Hopefully medications for Bipolar's will some day free them rather than mentally enslave them for the comfort of the keepers. "...or somebody really smart ran the world, like the people at the New York Review of Books." ha. Out loud chuckle. Nothing phonier than the wannabe-writer who reviews books and writes a review longer than the book. 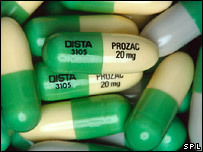 Read an article a while ago about baby boomers and how many are on antidepressants. The article offered a Top Ten List of stressors for baby boomers outside the regular Top Ten, and near the number one spot was caring for aging/dying parents. One line particularly stuck with me though I cannot quote it exactly: As baby boomers are waving goodbye to their last child, some are opening their homes to their aged parents and very often a child who comes back because living at home is cheaper. Half a dose, baloney works well. Abalone on half shell over looking Monterey Bay. mom used to say ''half the world's work is done by people who don't feel well''. Dr. Bliss, if shyness is not a disease, is excessive shyness to the point of becoming a recluse a disease? I'm starting to read "The Cult of Pharmacology : how America became the world's most troubled drug culture" by Richard DeGrandpre. Shyness is not a disease, but there are disorders related to shyness that are quite debilitating. One is social anxiety disorder and the other is general anxiety disorder. (GAD) Either can lead to agoraphobia, reclusiveness, and the defeating energy of that is that it feeds on itself and gets worse without help. i think some folks are just loners and like it fine that way. their troubles start when they assume there's something 'wrong' with how they like to be. The headache/Tylenol analogy is a good one, I think I'll use it with depressed patients, "You can take a pill until you feel better, you can do/think something different (CBT), and/or you can find out what's behind your headache." Nice - I think it'll be helpful. Incidentally, I think the above "and/or" is vital. When people are very depressed they tend not to want to think about long-term, sometimes painful work. However, I've noticed that it can be helpful when explaining to say something like: "The reason you're unable to set goals and stick to them now is that when one's depressed those centres of the brain aren't firing well. Let's put goals aside until your wheels are rolling more freely again." Paradoxically this is itself a gaol - patients tend to take hope from it and also show the beginnings of taking it as a challenge. I think Buddy�s right. Ones depression / cheerfulness is in proportion to their own perceived "comfort zone" fit with their current environment. Sharks like Slobodan Milosevic waste away when they can no longer dominate the little fish (when isolated in prison), while friendly and humanitarian teddy bear types like William Taft become depressed from all the political battles (while working as the most powerful man in the country). One might temporarily need drugs to get over some hump, but they should carefully examine their own survival situation first. �Chemical imbalance� is a marketing ploy. Thank you. I work on both sides of this issue: patients who need meds but think they are fine and everyone else is wrong, and patients who believe that a medication, rather than a life change, is going to make them happy.